Ok, I have to say sorry for the heading. If you are reading this then the world did not end on Dec 21st 2012. I hate to be the bearer of bad news. You may have been holding out on your fat loss goals due to the Mayan prediction. The reality is that you likely have another half century or more to hang out on the little blue dot we call home. Keep reading to find out how to make a huge impact in just 21 days that will catapult you onto the fast track for 2013. Does this sound familiar? It’s 6am January 2nd and your alarm clock goes off, time for work. Arrrgh! You look around the dark room as everyone else is still asleep. (unless you have a 2 year old like me who loves being up at the most random hours). You think to yourself it is a brand new year but everything looks the exact same as it did last year. You promised yourself that this year would be different. That you would strive to make the positive changes in your life and get a fresh start. How are you going to make this year different than every other year that has gone by? Are you going to make smart choices and decisions? Are you going to improve your eating? If you haven’t put any thought into it, then now is the time. I know I am showering you with a little tough love today but if you follow the 7 tip blueprint that I am going to lay out to follow, you may thank me. You will age and change in 2013, and next year on Jan 2nd, 2013 you will be slightly (or hopefully dramatically) different than you are today. If you don’t make changes immediately you will follow the exact same pattern that you have for the last 5 years. Now take a moment to go look in the mirror and then come back and read the rest of this… DO IT! Welcome back! What you saw in the mirror was a culmination of the last 5 years of either good choices or poor choices you have made. If you looked, smiled and said “Damn I look great” then you don’t even have to continue reading because you are obviously already on track. However, if you looked and you could barely look yourself in the eye then you had better read on. OK, tough love is over. Let’s get onto the good stuff. I am going to give you a blueprint to follow to shed unwanted weight in just 21days. 1) Get rid of all packaged and processed food from the home. Including the leftover stuff from the holidays. (put it in a bag/box and donate it). DO NOT READ ANY FURTHER UNTIL YOU HAVE DONE THIS! Only whole foods will be used from here on out. Go grocery shopping and stay out of the centre of the store (all of the crap is there). 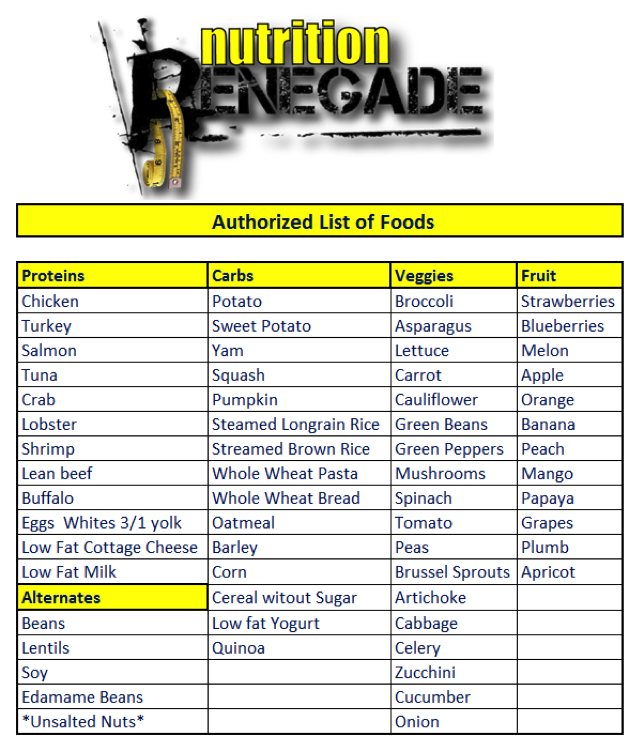 Use the attached Nutrition Renegade Authorized Foods List as a guide. 2) Replace ALL high calorie drinks (pop, soda (yes even diet soda), specialty coffee etc…) with water. Take your body weight in pounds and cut it in half. This is how many ounces of water you NEED a day to stay properly hydrated. Example: 200lbs/2 = 100 ounces for a 200 pound person. Add lemon, lime, cucumbers or berries to the water if you have a hard time drinking it due to lack of flavour. Alcohol plays havoc with your system and prevents you from going through your proper CREB cycle. This cycle renews your body every night in deep sleep. Oh, it also maintains a healthy metabolism J. 4) Cut out ALL sugar and artificial sweetener out of your diet. Use the palm of your hand or your closed fist to use as a reference for a portion. Each main meal will have 1 portion carbs, 1 portion protein, and 2 portions vegetables. Check the authorized list above for what foods fall into each category. 3 main meals and 2-3 snacks each day. Batch cook your food on Sundays so you can plan accordingly. Example: cook 10 chicken breasts, and 11 lean cuts of beef. Cut raw veggies, make salads, cook yams at the same time as meat in the oven or on the BBQ. Try not to miss breakfast. Remember you have only 21 days so you have to hammer your workouts hard and with a ton of energy. Short workouts are key. 30 minutes fit into a day perfectly. NO LONG BORING CARDIO ON YOUR FAVOURITE MACHINE. Interval training and/or body weight training/resistance training only. Check out Turbulence Training as well as Workout Finishers for some awesome stuff.